A member of the Qatari royal family and board of directors at Qatar Airways, His Excellency Sheikh Mohammed bin Fahd Al Thani’s life is filled with official duties. A former chief of military police, Sheikh Al Thani has since held several prominent positions in the Qatari government. It is a demanding schedule and his Paris residence is a welcome respite from this formality – a place where he can escape Qatar’s summer heat and create a retreat for his family and young grandchildren. 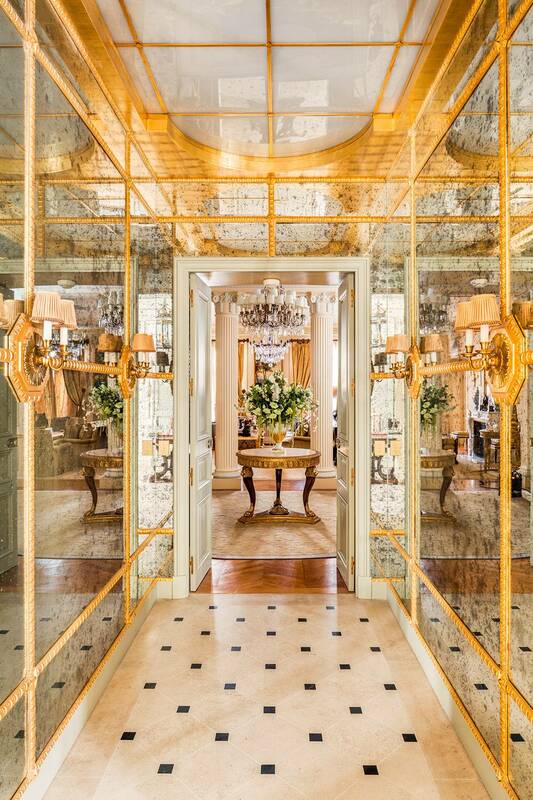 The property is situated just off Avenue Montaigne, in Paris’s Golden Triangle in the 8th arrondissement. The 800 square meter, 15-room manor, or hôtel particulier, was built in the 19th century in the typical Haussmann style of limestone and long, narrow facades. The previous owners had neglected the infrastructure and gutted the interiors, leaving it bare of any period detail. 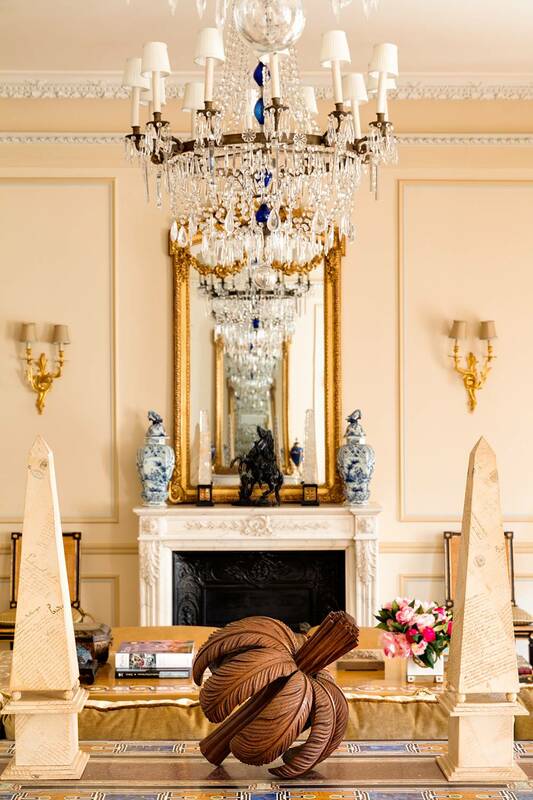 The Sheikh appointed interior designer Timothy Corrigan– known for his extensive experience renovating historic properties, from Georgian townhouses in London to an 18th century château in France – to restore the home to its erstwhile grandeur. A graduate of The Royal Military Academy Sandhurst, Sheikh Al Thani has spent significant time abroad, cultivating a worldly and refined sensibility that is commensurate with his position. “He has such an excellent taste. Sheikh Al Thani was involved in just about every detail. He is very clear about what he likes. The wonderful thing is that nine times out of 10, the items he selects are the ones I would have chosen on my own,” adds Corrigan with a laugh. Corrigan’s talent is distinctive; the Los Angeles-based designer has garnered a reputation for imbuing homes with an aristocratic air. The furnishings are either custom made or sourced from auction houses and antique shops around the world. While the home is undoubtedly very luxurious, the family’s comfort remains the most important. Although Sheikh Al Thani prefers rich environments, here, a more relaxed atmosphere is maintained with overstuffed sofas and antiques with masculine heft. A 19th century giltwood mirror, one of a pair, tops the fireplace. Photo by Mark Luscombe-Whyte for Vogue Arabia, June 2017. There is no predominant color scheme, with each room having its own character. However, blue and gold are used throughout the shared spaces, a nod to the reflection of the lights of Doha on the Persian Gulf. 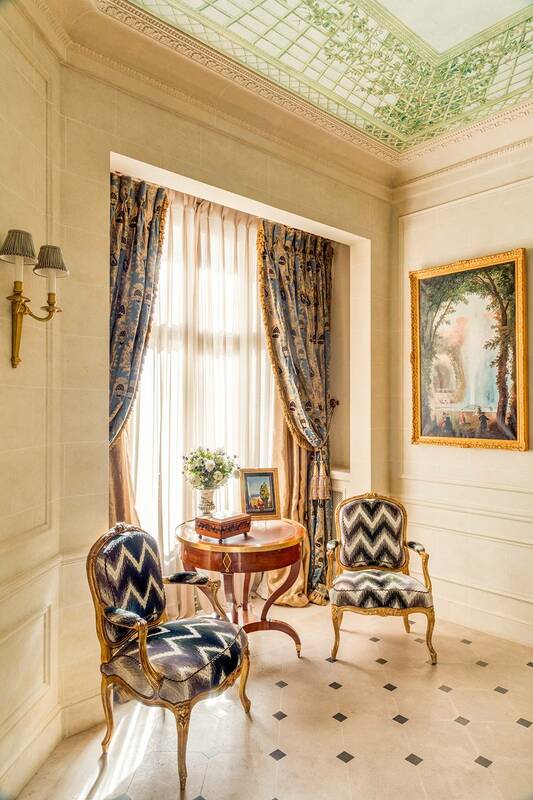 The home establishes a magnificent first impression, opening with an octagonal entrance hall with faux limestone walls and painted trelliswork ceilings, to give the impression of a perennially sunny Parisian spring day. This space connects to a passage of mirrors, with a trompe l’oeil skylight, leading to the central rotunda where an ornate fountain splashes softly. “I wanted to create a sense of course that draws a guest from the front door to the salon through a series of rooms that relate to the river and the city’s landmarks,” the designer says. The delicate clouds painted on the ceiling of the rotunda continue the illusion of open skies above. In a room filled with precious objects, such as the Empire period table showcasing flowers arranged in a porcelain Sevres urn, one item stands out: the marble and gilt bronze fountain of two cherubs embracing a swan. Part of a pair, the fountain was originally in the theater of the Palace of Versailles, until it was pillaged during the French Revolution. Although this one was recovered and bought on auction in London, the other fountain remains missing. Previously, the étage noble, or main salon, was divided into two inelegant reception rooms. After Corrigan demolished a wall to create one grand salon, with an entrance flanked by columns, it was furnished to create the symmetry for which French architecture is renowned. An enormous three-meter inlaid marble console defines two seating areas, each facing a fireplace and anchored by deep sofas covered in silk velvet. Corrigan designed the custom marble and gilt bronze coffee tables. The triple-hung draperies, a feature repeated throughout the home, were a specific request from His Excellency, who admires the old-world opulence of curtains in damask, brocade, and hand-embroidered silk. In the entrance hall, a Hubert Robert painting joins a pair of 1753 Louis XV Giltwood armchairs by Pierre Remy. Photo by Mark Luscombe-Whyte for Vogue Arabia, June 2017. Two 1736 paintings by Rococo artist Jean-Baptiste Oudry hang between the windows. Currently, Sheikh Al Thani visits Paris six to eight times a year, staying a few days at a time. The cigar room, with its wonderful burled paneled walls inlaid with tortoise shell, is one of his preferred spaces to relax. The master bedroom is particularly warm and welcoming, subtly decorated in soothing tones of pale blue, cream and bronze. “Every time people walk into the room they can’t seem to help but exclaim, ‘Ahh!’,” Corrigan says.